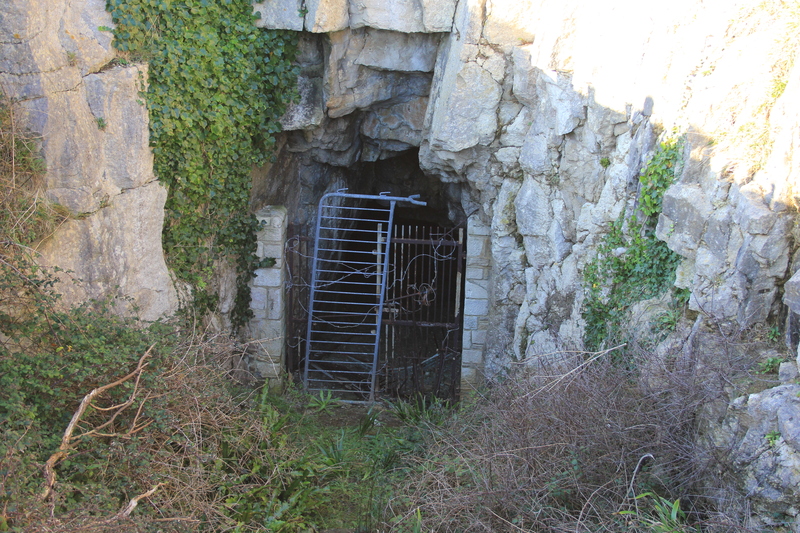 About a quarter of a mile beyond Durlston Castle and its Great Globe lies an entrance to the Tilly Whim Caves. 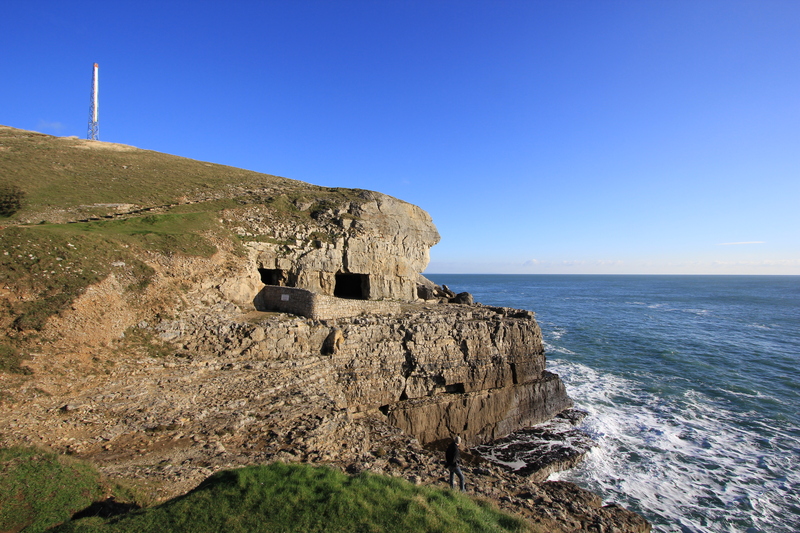 These are not natural caves, but rather a group of three limestone quarries dating back to the 17th Century. 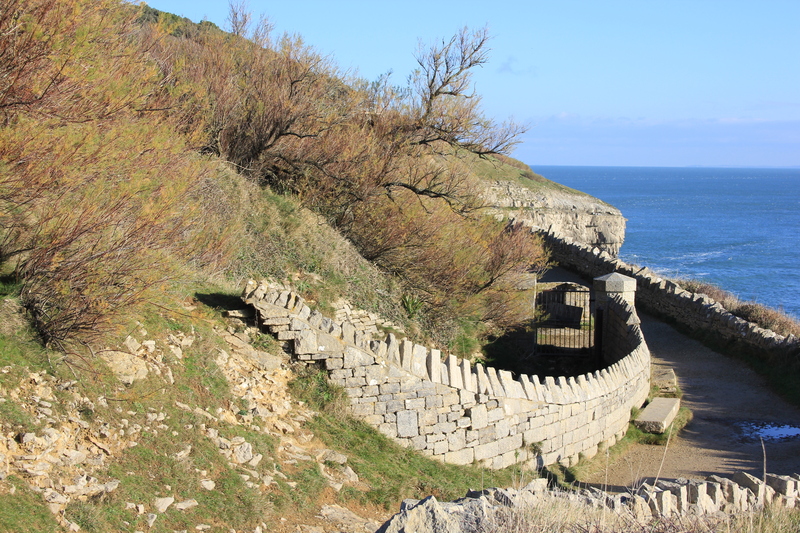 They were extensively worked in their day, producing stone which was used to build fortifications along the south coast during the Napoleonic Wars. After the end of the war demand for the stone fell; the quarries were little used from 1812 onwards, save by smugglers. In 1887 the owner of Durlston Castle re-opened the caves as a tourist attraction. Public access continued right up to 1976 when serious rock falls made the caves so unsafe that they were closed. They remain closed to this day. This is the old tourist entrance. It is thought that the caves got their name from a former quarryman named “Tilly” and the word “Whim”, a type of crane. The whim would lower quarried blocks down the cliff edge and into waiting boats below. These boats would then transport the blocks off to a larger sailing ketch anchored out at sea, or take them direct to the yards at Swanage. I gazed at the entrance wondering what might be inside. I looked at the heras fencing that was blocking the access. But no, that was a bad idea. Even I could see that! Slightly further along the coast we came to another entrance. This entrance was also accessible if you really wanted to have a look around; indeed I know one person who has gone into the caves from here to explore. “Are they dangerous?” I asked. “Not at all,” he said, “Unless they collapse…”. 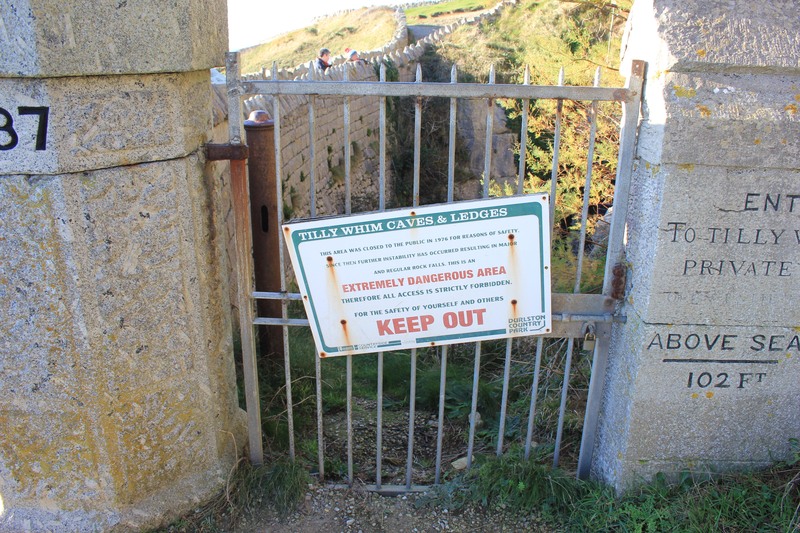 This entry was posted in Dorset and tagged caves, coast, Dorset, Durlston, quarry, South West Coast Path, Tilly Whim Caves, travel, walking. Bookmark the permalink. Good progress. You’ll be Jurassic very soon! It’s not just me that’s been tempted to try and get in those caves then! I’ve not done it, but the thought of trying has certainly come to me.